The new 2019 Jeep Wrangler JL has been officially unveiled at the LA Motor Show today, with a raft of new technologies and new engines but – the company claims – the same focus on 4×4 capability. 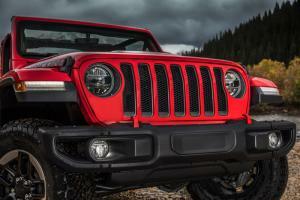 In the US the new Wrangler will be offered initially with two engines. The first is a new 2.0-litre four-cylinder turbocharged petrol engine that makes use of the company’s eTorque system, making it a mild hybrid, complete with regenerative braking. It’s mated exclusively to a new eight-speed automatic transmission. The familiar 3.6-litre Pentastar V6 will continue to be available, and in the new JL Wrangler it offers 285hp and 260lb/ft of torque. The addition of stop/start is said to increase economy, and while the eight-speed auto will be offered as an option, as standard it is mated to a new six-speed manual transmission. Starting in 2019, a 3.0-litre V6 diesel will become available in the US for the first time, although it will be familiar to European buyers from the Grand Cherokee. 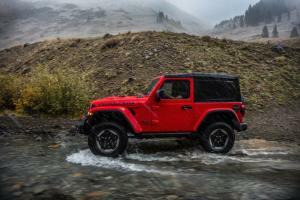 In the new Wrangler, it is expected to deliver 260hp and 442lb/ft of torque. For the UK market, the 3.6 V6 won’t be offered. 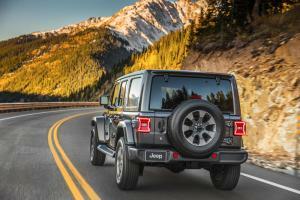 Nor, it seems, will we get the 3.0-litre V6 diesel, despite it being the engine the Wrangler has been crying out for for years. Instead, we’ll have to make do with a 2.2-litre four-cylinder diesel unit from Alfa Romeo that, in the Wrangler, delivers 200hp and 450Nm of torque. While the new 2.0-litre turbo petrol will also be offered, it does not include the eTorque mild hybrid system. It’s also rather peaky, its 272hp not arriving until 5,250 rpm while peak torque of 400 Nm arrives at 3000 rpm. 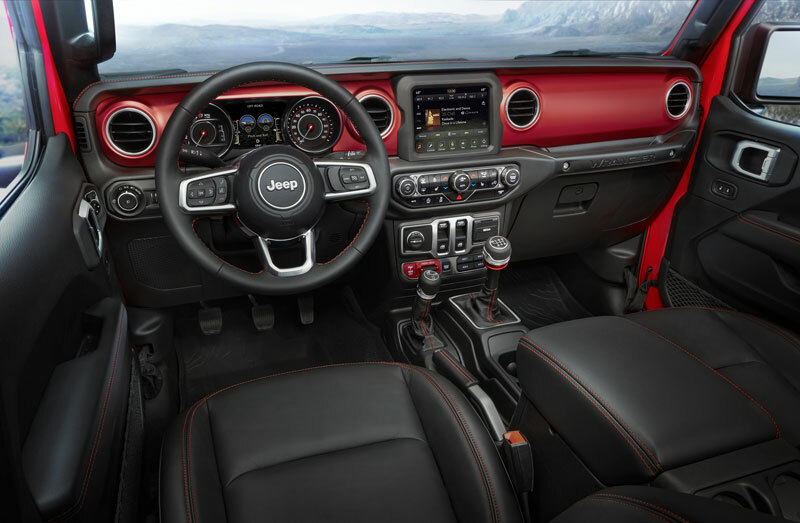 This also means that no Wrangler in the UK will have a manual transmission, as both power-plants are mated to the new eight-speed auto whether you like it or not. In 2020, Jeep is expected to add a fourth drivetrain option to the Wrangler in the guise of a new plug-in electric model, although details of this haven’t been officially released. Three four-wheel-drive systems are available in the US, starting with the familiar Command-Trac part-time system fitted as standard to Sport and Sahara models with a 2.72:1 low-range. Rubicon models are equipped with a Rock-Trac system with a 4:1 low-range and Tru-Lok locking differentials both front and rear, plus an electronic sway-bar (anti-roll bar) disconnect. 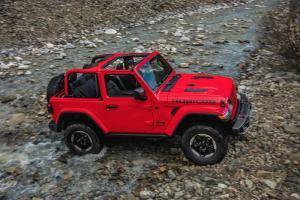 The more luxury-minded Sahara model, however, sees the debut of a full-time 4WD system for the first time on a Wrangler. Dubbed Selec-Trac, it offers both high and low-range modes, plus both part-time and full-time 4WD modes – the latter for use on the road. 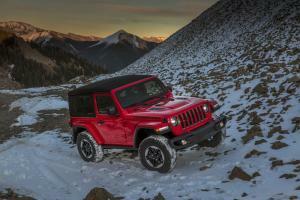 In a confusing twist, all Euro-spec Wranglers will be equipped with the full-time Selec-Trac system, although Jeep will continue to refer to them as Command-Trac for Sport and Sahara models and Rock-Trac for the Rubicon. For the Sport and Sahara, the transfer case features a 2.72:1 low-range, while the Rubicon’s version features a 4:1 ratio. 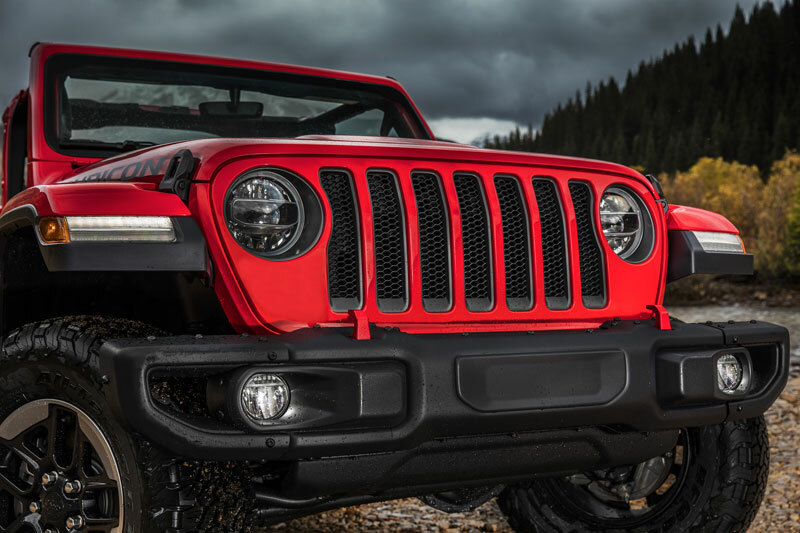 However, it is not a heavy duty transfer case in the way the US-spec Rubicon’s is, added to which it’s not clear what axles the Euro Wrangler will be equipped with – although it’s unlikely it’ll come with the wider heavy duty Dana 44s from the US models. 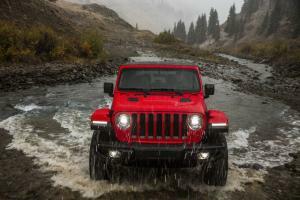 Jeep does mention the front and rear electric diff locks for the Rubicon, along with the electrically disconnecting front sway bar (anti-roll bar). 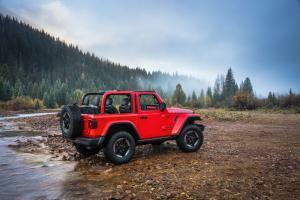 In the US, Jeep claims the new Rubicon models offer increased suspension travel and axle articulation over the previous Wrangler, the 33-inch tyres contributing to ground clearance of 10.9 inches, a 30-inch water fording capability, and approach, break-over and departure angles of 44, 27.8 and 37 degrees respectively. 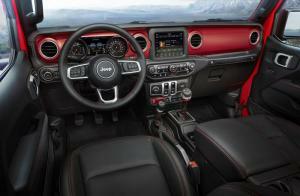 But for all its off-road capability, Jeep claims the new Wrangler is the most technologically advanced ever. That starts with the option of LED headlights, fog-lights and tail-lights on Sahara and Rubicon models, and continues with a Sky One-Touch power top that – from Q2 2018 – retracts the soft top at the touch of a button. For the remaining models, there’s a new Sunrider soft-top that features two additional bows and new slide-in window panels – gone are the zips of the old model. A three-piece hard-top is available on all models – with the option of body-colour on Sahara and Rubicon, black on Sport and Sport S models – and is said to offer lighter removable panels with improved latches for easier installation. Inside, there’s a new instrument cluster with either a 3.5 or 7-inch central TFT display, while the company’s Uconnect system receives a comprehensive update and the choice of 5, 7 or 8.4-inch touch-screens. 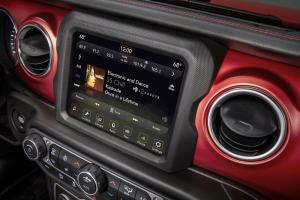 Both Android Auto and Apple CarPlay are included. 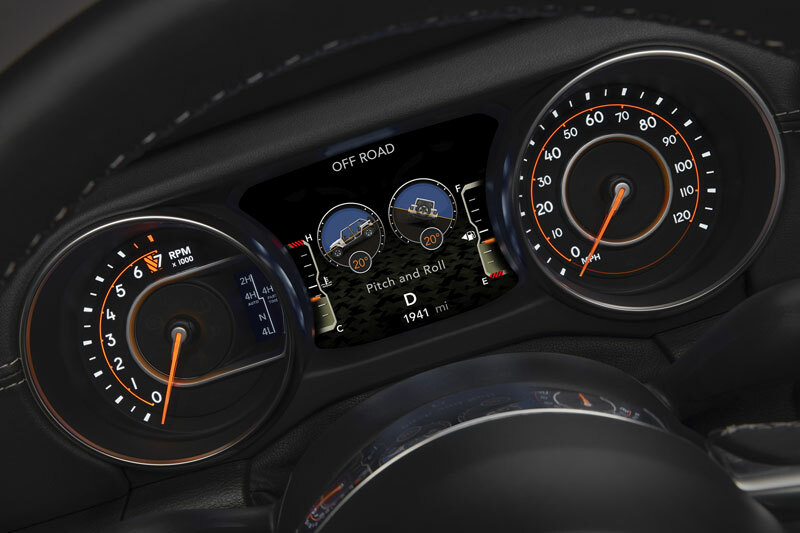 In addition, Jeep says that more than 75 safety and security features are available on the new Wrangler, including blind spot monitoring, rear cross path detection and a reversing camera. 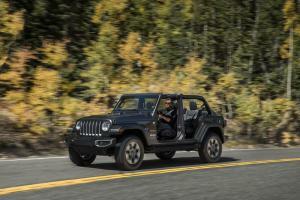 They have, however, kept the features that Wrangler owners loved – the doors are still removable, while the windshield can still be folded flat against the bonnet and, thanks to a new hinge arrangement, this is now easier than ever. 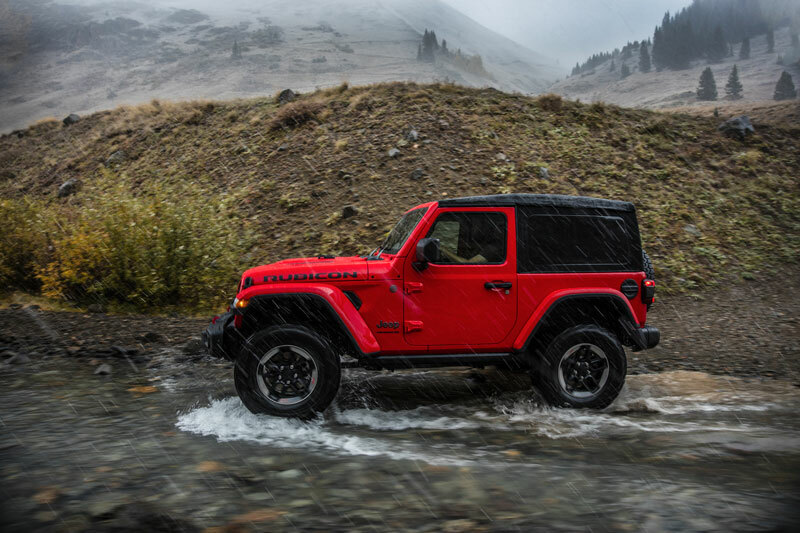 In the US, the new Wrangler is priced from $26,995 for the entry-level Sport – a $3,000 uplift over the old Wrangler JK – $30,195 for the Sport S, and $36,995 for the Rubicon. 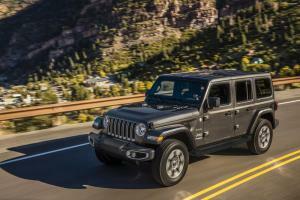 Wrangler Unlimited 4-door models are priced $3,500 over their 2-door counterparts, with the 4-door only Sahara priced from $37,345. Update 10/10/2018: UK prices have now been released, although for the 2.2-litre diesel only – the 2.0-litre petrol isn’t expected until December. The range starts with the 2-door Sahara 2.2, priced from £44,495. The one everyone wants, the 4dr Rubicon, will set you back an eye-watering £47,995. Pastel paint colours cost an extra £675, while Metallic is £775.